Some kind of Lee-Enfield? Khyber pass copy? resembles some pics I've seen of Maumau cobbled together weaponry. looks like a shotgun barrel, an Enfield mag, and a home made stock. Heh, reminds me of those VC Thmopson copies. 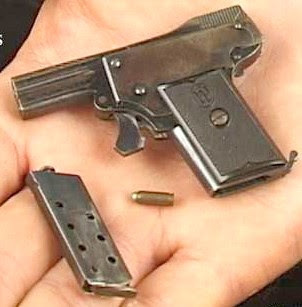 Kolibri. It's .11 caliber, I believe. easy for me as I have one of these in my gun cabinet.. I posted this a long time ago, any guesses? Something that would hurt your shoulder?